Crowd trouble marred the Turin derby between Juve and Torino at the weekend. AFTER CROWD TROUBLE marred Sunday’s Turin derby between Torino and Juventus, the Juve manager Max Allegri has claimed ‘only a madman’ would bring children to see live football played in the country. 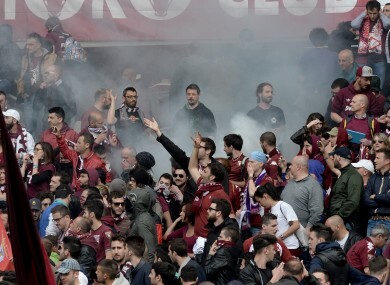 Torino fans attacked the Juventus team bus as it arrived at the Stadio Olimpico while during the game, a paper banger was thrown into the home support with 10 Torino fans injured as a result. Another explosive was thrown later in the game and injured another supporter. According to Italian national TV station RAI, two fans were arrested. Allegri, whose Juventus side lost 2-1, offered an honest assessment of Italian football after the game, in light of the spate of controversial incidents that have cropped up throughout the current campaign. “I’m sorry [about what happened]. On the pitch we had a match that was fair, manly and compelling,” said Allegri. In the last few months, an underage AC Milan team were reportedly subjected to racist abuse in a game against Paris St-Germain while just recently, Roma were ordered to close part of their stadium after fans displayed banners insulting the mother of a Napoli fan who died after fan clashes last year. Email “'Only a madman' would bring children to see Italian football, says Juve boss ”. Feedback on “'Only a madman' would bring children to see Italian football, says Juve boss ”.